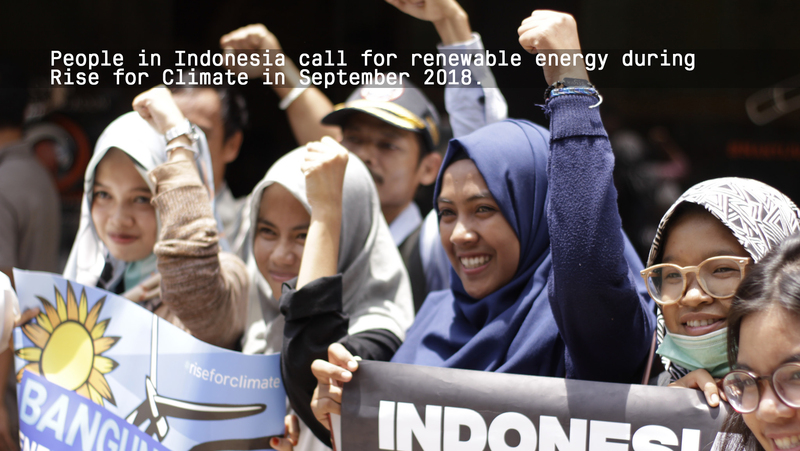 As the eyes of the global climate movement turn to COP24, the UN Climate Talks which will start next week in Katowice, Poland, there’s a palpable sense of momentum coming from your campaigns around the world right now. The Stop Adani movement got some shock news that the mine is now funded and will be holding snap actions all next week. I was in the room at Climate Finance Day in Paris on Wednesday, where the CEO of France’s national pension fund, the CDC, announced they’ll no longer invest in coal. That’s a big deal. What’s more, in Germany the government is feeling the people power pushing for a total coal phaseout. It feels like we’re closing in on coal for good -– and movements like ours are pushing for a just transition for fossil fuel workers to renewables. But there are massive carbon bombs like gas pipelines and tar sands extraction being planted around the world right now as governments meet in Poland. We’ve got 2 short years to keep fossil fuels in the ground. Enjoy this 10th edition of Fossil Free News – and the video rundown to go with it. Would you share it with someone in your community to help get the word out? 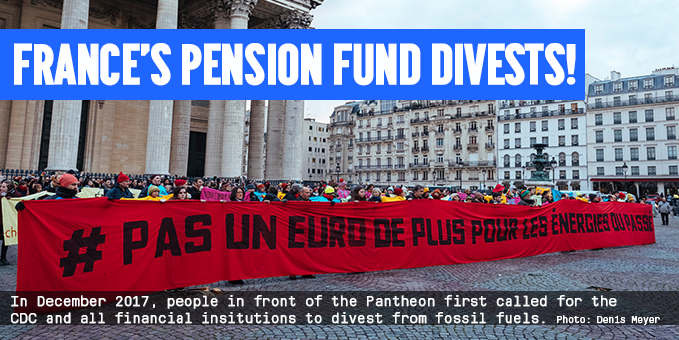 In France, a campaign that started only a year ago has seen a major breakthrough: the €160-billion CDC public pension fund will no longer invest in companies that make more than 10% of their earnings from coal. That will genuinely exclude 100s of the most polluting companies on the planet. It will also impact investments into RWE, a major German coal company building huge lignite mines. People across Europe are welcoming the move, but pushing for the CDC to take the next step and divest from oil and gas, too. People across France will be sounding the climate alarm and are calling for public actions and marches everywhere on December 8. Sign up here if you’ll join them. Ahead of CO24, the countries most vulnerable to climate change held a virtual summit to urge more serious ambition. 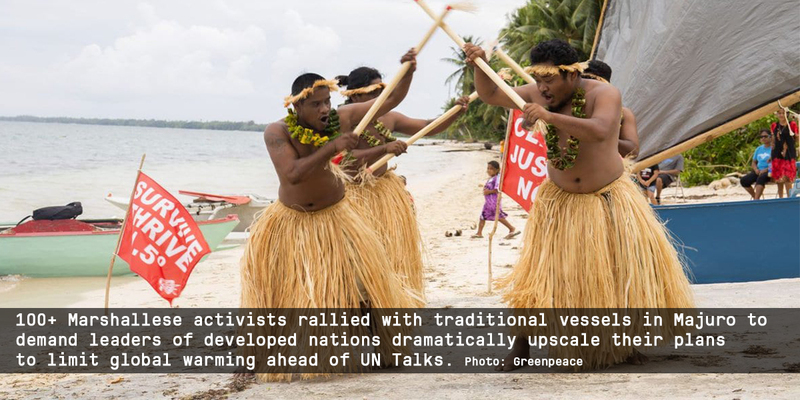 During the 24-hour meeting, Vanuatu announced it was exploring the possibility of legal action against fossil fuel companies for the damage they’re causing. Then, in Australia, Adani shockingly announced that they had secured funding to go ahead with their enormous Carmichael mine – the catch is, they are self-funding it to drive through approvals. Snap actions are anticipated in the coming week so make sure you’re on the look out for ways to act in solidarity. All over, people are resisting the carbon bombs being planted, and pushing for a just transition to ensure workers get a fair deal. In Canada, a new campaign is putting pressure on national leaders to support a policy that would phase out fossil fuels while guaranteeing good jobs for impacted workers, striving for 100% renewable energy, and respecting Indigneous communities. Meanwhile, in the UK, a new Extinction Rebellion movement has kicked off and been garnering lots of press attention on #climatebreakdown in the wake of the 1.5˚C report. It uses civil resistance tactics such as blocking traffic — two weeks ago they blocked all 5 major bridges through central London. Over 1000 people have so far been arrested for disruptive actions meant to bring public attention onto the current emergency. There’s a real buzz around the idea, a rapidly growing network and also some critics of the group’s strategy. We’d love to hear what you think – add your comments on Fossil Free’s Facebook. And maybe Brandeis University in the United States? 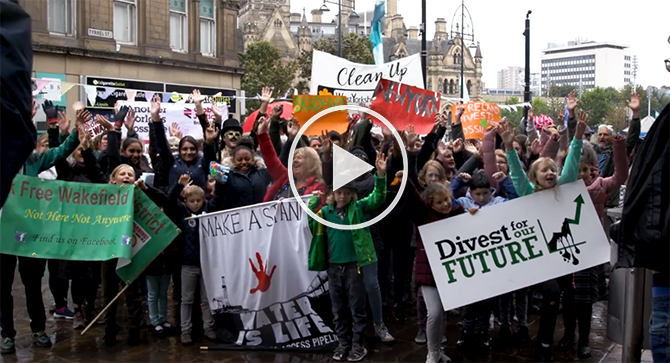 Watch this great video of Fossil Free West Yorkshire’s rally from September, where they brought the community together to demand the city divest its pension fund from fossil fuels. Juliana vs. US is an inspiring climate lawsuit playing out right now in the United States, and it could be huge. The “No Ordinary Lawsuit” podcast goes behind the scenes of its genesis. There are 4 episodes lined up, produced by Our Children’s Trust. Was 2018 the year you woke up to climate change? 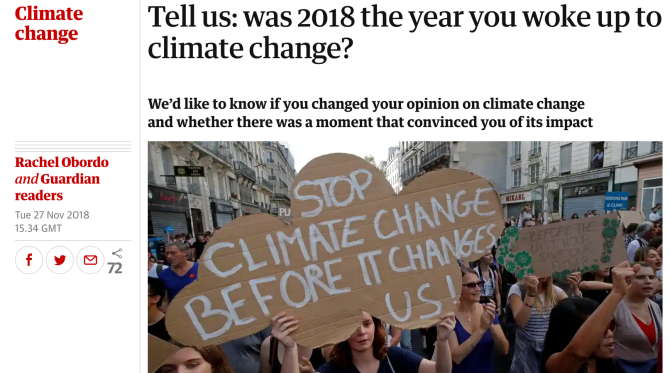 If the extreme weather has flipped a switch for you, consider contributing your story to The Guardian, who are taking stock of how much climate concern and action has ticked up this year.